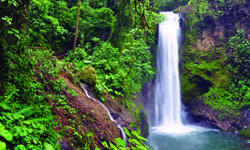 Journey through Costa Rica to discover a wealth of natural delights. 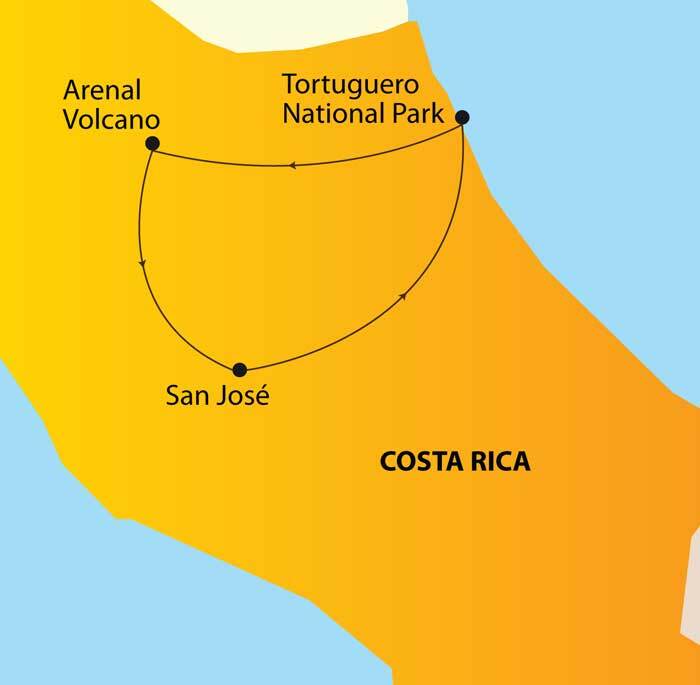 From the highlands of San José, visit a coffee plantation and a unique biological research park where you’ll learn of the country’s ecological richness. In Tortuguero, a national park situated off the Caribbean coast and breeding ground to the Green Turtle (July to October), you travel by boat through rainforests home to exotic birds such as toucans and macaws as well as monkeys and rare manatees. In the Lake Arenal area overlooked by a massive volcano where thermal hot springs are found, you’ll visit an important wetlands region as well as enjoy many exciting, optional adventure excursions. Upon arrival to San Jose’s International airport a a MYESCAPADES representative will meet and greet arriving guests, followed by the transfer to selected hotel. Guests will also receive travel documents and a complete explanation on the following day’s activities. Passengers will enjoy a great buffet breakfast at the hotel and get ready for the day activities. 07:00 am	Pick up at the lobby of the hotel for the transfer to Poas Volcano National Park area for tour and lunch. DOKA Estate is a real working Coffee plantation, located on the slopes of the Poás Volcano, offering a fantastic learning opportunity, for participants to be guided through all the coffee production stages, from the plant on the coffee field where first choice beans are hand picked and after a selection process these are turned into a fabulous cup of coffee. Walk through the planted fields at their breathtaking panoramic view location, see the “beneficio” (coffee mill) and smell the aroma emitted by sun bathed patios where the beans are sun dried every morning. Finally you will be able to sample all of the roasts and purchase unique gifts at the “Casa de Artesania”, while gaining a new perspective about Costa Rica’s coffee Culture! Early morning pick up at hotel, followed by transfer to Caño Blanco dock with a stop en route in Guápiles for a traditional breakfast. On arrival to the dock visitors will board a boat, which will take them through canals to the Tortuguero National Park (approx. 2 hours). On the way they may observe different flora, fauna and wildlife. Arrival to the lodge on time for lunch and to check the schedule for local activities with the hotel guides Visitors will be at leisure in the afternoon to experience the local culture developed in this lush tropical environment, visit some of the area's natural attractions, walk the nature trails or just relax in comfort on a hammock from a location overlooking the lush canals. After a family style breakfast at the lodge, begin the day with a nature walk trip, returning to hotel on time for lunch. Tortuguero is situated on the Caribbean coast of Costa Rica. The park covers 18,947 hectares and protects green turtle egg-laying grounds (July to September) and lowland rainforest which is home to a wealth of wildlife – 300 species of birds including toucans, herons, hummingbirds and green macaws, and other animals including monkeys and the rare manatee. The plant life in the area is also particularly rich due to the very high annual rainfall. You can explore the wildlife from the canals. After an early morning breakfast, participants will be collected from the lodge and taken back to Caño Blanco, where land transportation will be waiting for them. Stop on route for lunch at a local restaurant in Guapiles, and change bus to continue the route to Arenal with stop on route to learn more about our local products with the Chocolate Tour at Tirimbina Biological Reserve. The Chocolate Tour: Discover the wonders behind one of the world’s most tantalizing foods — chocolate! The cacao tree originated in Mesoamerica and has a rich and extraordinary history, being one of the most important products for Mayan and Aztec civilizations, as well as other Central American cultures. The discovery of the Americas led European explorers to introduce chocolate to Europe, which transformed it into the delicious product known today. In this activity you will discover the marvels of one of the favourite foods of humankind - chocolate. The tour includes a guided hike across the Tirimbina suspension bridge to a cacao plantation, as well as to a forested section where you will observe forest species of cacao and how the product originally developed there. During the hike, the natural and cultural history of the cacao tree is explained. Onsite, you will learn about the process by which cacao is processed into chocolate (harvesting, fermentation, drying, milling). There also you may taste different types of chocolate, made from organic chocolate grown by the Association of Amazilla Women of the Caribbean, a group of rural women from Pueblo Nuevo de Guácimo dedicated to the production of organic chocolate. Arrival to the hotel in Arenal in the evening for rest at leisure and enjoy the hotel facilities like the spa and pool. Dinner is at leisure on own. Breakfast included at the hotel. Guests would be picked up at the lobby of the hotel in order to start today’s activity. Enjoy a different perspective of Arenal Volcano on the Sky Adventures Park. First you will start with the tram that reaches an observation area at the highest point of the Arenal Reserve, from where you can admire the natural beauty of the rain forest, the volcano and lake. Once you have reached the observation deck, you will feel the adrenaline and enjoy magnificent views on the Sky Trek. This is a tour of adventure full of adrenaline high above the treetops, allowing you to observe the rainforest at its best and stunning views of the Arenal Volcano and the Arenal Lake. The tour includes 8 cables with distances up to 2460 feet and a maximum height of 660 feet. Return to hotel after lunch on your own with ample time at leisure to rest or enjoy the hotel facilities. Dinner is on your own. After breakfast (if flight schedule permit), departure on transfer back to international airport to fly back home… OR Continue the adventure with a travel extension to another unique destination within Costa Rica. Price varies by season. Contact us with your specific travel date. Hotels subject to change.